The name Stephanie Kwolek might ring a bell for some people, but for motorcyclists, it should mean a great deal—especially those who wear protective head gear. Kwolek, who died this year at the age of 90, was a scientist with the DuPont Company in the 1960s. She researched polymers and, more importantly, steered the way toward the creation of Kevlar. The light, synthetic fabric was found to be so strong that it became the main ingredient in a variety of protective gear, including bulletproof vests and motorcycle helmets. The breakthrough in Kwolek's work has proved to be ever-changing as scientists continue to find ways to improve motorcycle helmets. Kevlar is a fiber that, ounce for ounce, is five times stronger than steel. It has improved helmet safety standards tremendously, yet scientists are still working to improve on Kevlar helmets. Why? Because our brains are delicate gobs of goo. As tough as Kevlar is, it can't fully protect in a motorcycle crash. Our brains are surrounded and protected by three layers called meninges, which are made up of pia, arachnoid and dura mater, with the skull being the hard, outer capsule keeping it all in place. Gradually, scientists have learned that our brains float inside the skull like a sailboat at sea. You can make a sudden stop with your head, but inside, the brain is in fluid motion, stopping like a sailboat would in rough waters. Thus, sudden, violent stops can cause the brain to crash into the inner walls of the skull, causing the brain to shear, bleed or swell. Because of this, helmets had to include some sort of inner lining to cushion the blow of a sudden, violent stop, absorbing the impact by flexing within the outer shell. Check out the variety of helmet designs available today—there are a number of different liner designs that help absorb that impact energy. The lining consists of expanded polystyrene or the same kind of material in beer coolers and packaging material. 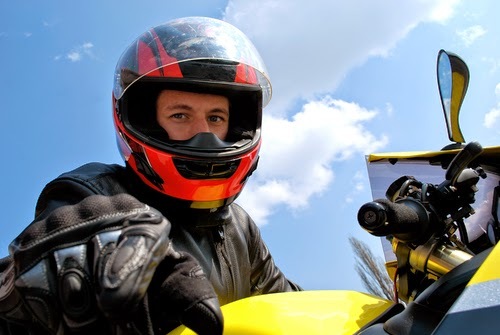 Though it is optional to wear a helmet in many states today, many motorcyclists choose to protect themselves, which has proven to reduce the risk of being killed in an accident by 37 percent. There are plenty of trendy designs from which to choose: the Skully P-1 comes equipped with standard safety material, but also has mobile technology. It features built-in heads-up display, which enables the rider to access GPS and Bluetooth, and even email can be set up to display a live feed from a 180-degree rear view camera. Using technology like this, manufacturers are further encouraging motorcyclists to embrace the helmet movement. Helmet design companies like Riddell, known or making football helmets, are working to understand the science behind the brain's reaction to highly violent impacts, which is highly common in the sport of football. Riddell's 360 design has become the standard helmet for many teams, proving to improve concussion prevention in players. Its hexagonal liner system inside the helmet helps reduce incoming energy from frontal impacts. Riddell's work is similar to other helmet companies are working on to improve headgear. Swedish company Hövding is experimenting on an airbag helmet concept, which removes the use of a traditional helmet altogether. Though intended for bicycle riders, the inflatable device is worn on the collar around the neck and triggered by sensors, resembling a ballooned pillow around the rider's head. There's even a helmet design that activates a chemical packet after a crash that supposedly cools the rider's head to prevent brain swelling. Today's standard motorcycle helmets come in all shapes, sizes, colors and features. Nearly all options are made of Kevlar or some type of polycarbonate plastic or fiberglass, and interlined with a cushioned material to lessen the impact in a crash. Science, led by Kwolek's work, has given motorcyclists many options to choose from, and which helmet a motorcyclist chooses depends on the rider himself. Be assured, however, that whichever modern helmet a rider selects, includes a long history of evolved science behind it with one ultimate goal in mind—protecting that precious brain.